You’ve been in and out of meetings all day and are finally able to sit down and start on your work. You’re stressed out and don’t know how you’re going to get through the rest of the day. Your headphones catch your eye. Just what you need. As more and more research is developed, music in the workplace is being changed from a way to tune out to a way to tune in. 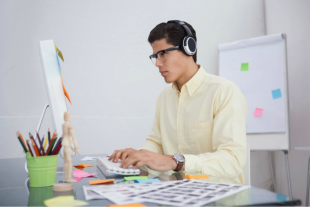 Music can be linked to increases in productivity through changes in mood. “In biological terms, melodious sounds help encourage the release of dopamine in the reward area of the brain, as would eating a delicacy, looking at something appealing or smelling a pleasant aroma”, according to Dr. Amit Sood of the Mayo Clinic. Through this, music is able to reduce stress and allow people a more open mind when confronting that large stack of work they’ve yet to get to. Obviously, music doesn’t help everyone focus all the time. Listening to music and focusing on whatever work is in front of you at the same time requires your brain to focus on two or more things at once. In instances where writing or remembering new information is necessary, music can actually hinder productivity. This isn’t to say other genres or styles of music interfere with productivity as well, there are simply certain kinds to veer away from. Shockingly, studies have shown that in some cases even music you don’t like is more helpful than dead silence. Genres such as classical, ambient, dance, or anything instrumental can all help you hone in and get work done faster, and with fewer mistakes. This kind of music has been shown to allow people to take over the environment around them, block out distractions, and become more determined to complete the work in front of them. In the end, everyone’s taste in music is different, so there is no single genre that increases productivity. However, due to effects on the brain, music in general has been shown time and time again to increase productivity and focus on certain aspects of work. So, experiment with different styles and hopefully soon you can find something that works well with you and your workday will feel like a breeze.